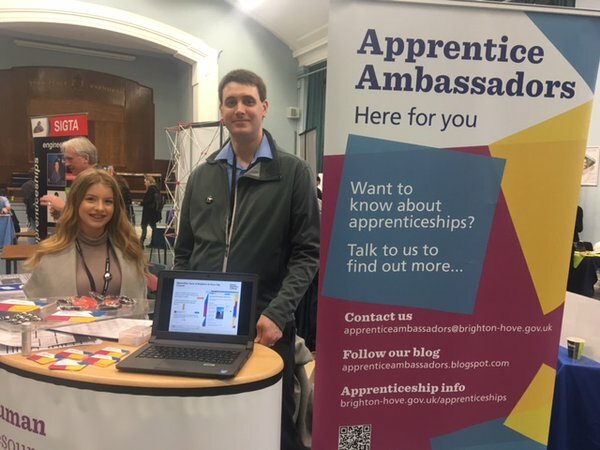 Our apprentice ambassadors, Georgia Easteal and Trevor Lee attended Varndean College’s Apprenticeship Event yesterday to speak to young people about Brighton & Hove City Council and the apprenticeships they provide. The event consisted of 23 different employers and training providers from a range of job sectors education, social care, finance, creative and digital media, construction and more. Trevor and Georgia spent the day speaking to Year 11s and college students about what options there are after they finish their education. They advised people on apprenticeships, what they involved and where they could lead in the future. Many students said they were interested in doing an ICT apprenticeship and Trevor, an ICT apprentice himself, was able to explain to them all the different kinds of ICT apprenticeships that the council provided. 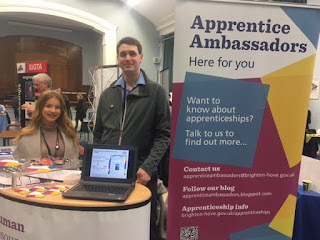 Georgia, Sustainable Transport apprentice, said: "There were a lot of people who showed a real interest, and it was great to be able to show them all the pathways that apprenticeships create."